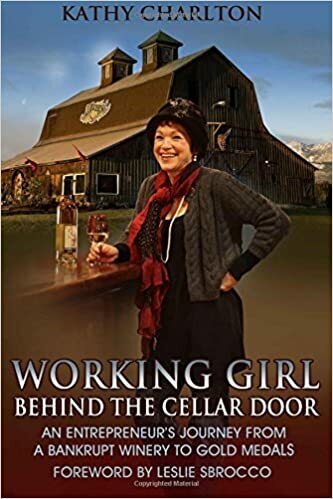 In my new book, Working Girl: Behind the Cellar Door I talk about what it takes to run a small business and why it is so important to put yourself at the top of your list on a regular basis. The little white card taped to the wall by the painting proclaimed its title, Curse of the Good Girl. But as I stared all I had were flashbacks... dozens of thoughts swirling through my head. I’d already circled the gallery a couple of times just sipping wine, chatting with folks and glancing at all the art. Then I put my glasses on and walked more slowly, finally standing in front of this whimsical piece. At first it conjured up childhood memories, then hurled me back into high school insecurities, two marriages, kids, careers, and oh my God, now the Grandma Club. 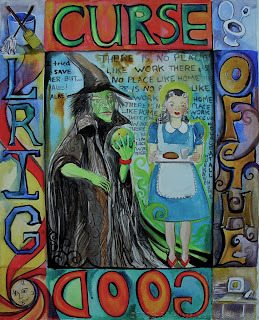 Picture this… the focal point of the painting is two characters, Dorothy from the Wizard of Oz and the Wicked Witch of the West (turned good?). How many times have I watched that movie as child, parent and grandma? You could almost hear the Wicked Witch with her icky green skin and crystal ball muttering; “I tried to save her but… alas, alas” in her most disgusted voice. I could have been totally alone in the gallery as I found myself looking down at my shoes, almost expecting them to be red sequined. Did I really stand there and click my heals together? Was I unconsciously trying to rid myself of the Curse? You know… the one that’s genetically inbred into all us women. I bought the painting and it’s been sitting here in my office for 3 months. I find myself staring at it whenever I’m pulled in 5 different directions at once. When I was her age, it was ALL about work. I really wanted to succeed in the corporate world… to be recognized and rewarded for the job I did. Getting to daycare on time, soccer Mom duties and making homemade school treats were always my hot spots of failure. But as I write this, I think maybe we of the “fabulous 50s+++ club” helped lift the CURSE. Our generation paved the way for our daughters. While it may not be perfect, the work environment today is much more flexible and accommodating for women and families. Choices can be made! My daughter is a much-in-demand physical therapist... who works on her own terms just 3 days a week. And so, in the spirit of the Curse of the Good Girl, I want to leave you with a parting thought. Don’t add the “P” word to the Curse. There’s not enough power in the Witch’s crystal ball to rid us of the need for everything to be just “PERFECT”. So, look at your holiday list of “to-dos” this year. Pick out the true “family traditions” to carry on, add in a good dose of family time with no agenda, and above all, put yourself on that list! Wife, mother, sister, grandmother, caregiver, friend… you wear a lot of hats. Take care and love yourself, too.